The Power of Words! | I am JuJu! Our words are SO powerful! They have the power to build someone up or to tear someone down. I have been on the receiving end of hurtful words more times than I can remember. Sadly enough, I have been on the giving end of hurtful words more than I would care to admit. I recently wrote about Words & Their Consequences. You can read about that here if you missed it. Today I want to focus on the power of using our words to encourage others. Over the years I have learned that my girls do NOT respond well to raised voices. In fact, Hailey will completely shut down if she gets yelled at by anyone. When I was a school nurse, one of the perks of my job was that I got to choose Hailey’s teacher. I didn’t have a choice with Skylar as she was in the inclusion class. I was always blessed that, overall, she had great teachers. Many of those teachers are some of my best friends today! Picking a teacher for Hailey wasn’t as easy a task as you might think. She works at her own pace. She doesn’t get in a hurry for anyone! When Hailey was in Kindergarten, her teacher lovingly said that “Hailey runs on Hailey Central Time”. I remember thinking that was a perfect description! I’m pretty sure that all of her past teachers would agree with that! When I chose her teacher for the following year I had many criteria, but the most important thing was that the teacher was firm, but loving. Following that criteria has NEVER failed me. When I think back on all of her teachers from preschool until now (5th grade) they have all been women who were firm, but very loving and motherly towards her. They were also women who were great encouragers! For that, I am eternally grateful! Years ago I read a book by Gary Chapman called the Five Love Languages. He also wrote a book Five Love Languages of Children. There are also a bunch of other versions (teens, men, etc.). Basically there are 5 love languages (gifts, quality time, acts of service, physical touch, and words of affirmation). Hailey’s love languages are definitely: words of affirmation & quality time. I honestly believe that Hailey would rather hear us tell her we love her or that she is doing a great job than get a new toy or game. She also loves to have one on one time with me or Chris. Skylar on the other hand would take a new video game any day of the week! We tell the girls that we love them probably 30-40 times a day, but I’m always looking for new and creative ways to love on them. Earlier in the school year I put a rice crispy treat in Hailey’s lunch. This wasn’t anything new, but it was one of those treats that is pre-packaged with a space to write something on it. I decided to jot a quick note: “Hailey…I think you are AWESOME!” on it. The next morning as I was packing her lunch, she said “Hey mom, did you write a note on my rice crispy treat yesterday?” I of course told her that I did. She then said “I really loved that!” Well that got me thinking on what other things I could do to tell her or show her that I love her. Last year, I saw a really neat idea on Becky Higgins’ website and decided to implement it in our own home. 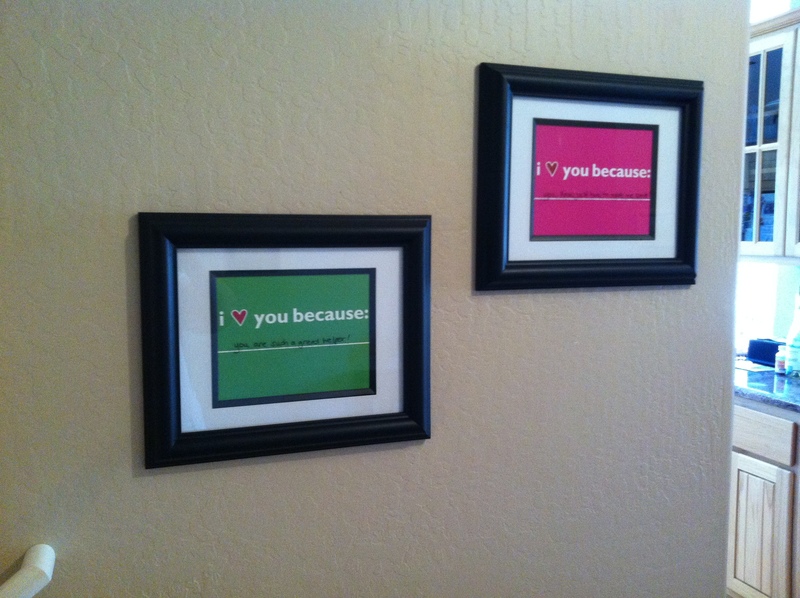 I purchased these really awesome “I love you because” prints made from kikicomin. She sells them in various sizes, but I purchased 8×10 prints. I put them in frames I bought from Hobby Lobby and hung them in our entry way. I use a dry-erase marker and write directly on the glass. I love that I can just quickly wipe off the glass and write something new. She also sells them as part of a set you can download, print off, and slip in your kids’ lunch boxes. I LOVE that idea!! Just a little side note: Kiki sells these for a discounted rate if you buy multiples, so I bought 8 of these and gave 4 to my sister so that she could use them for her 4 kids. I hung the 2 in my entry way, but I am planning on using the other 2 so that Chris and I can write notes to each other as well. I just sent her a quick e-mail telling her what I needed and she was super quick in getting back to me. It’s been really fun to come up with different reasons for why I love them. I try to do a mix of funny and heartwarming. 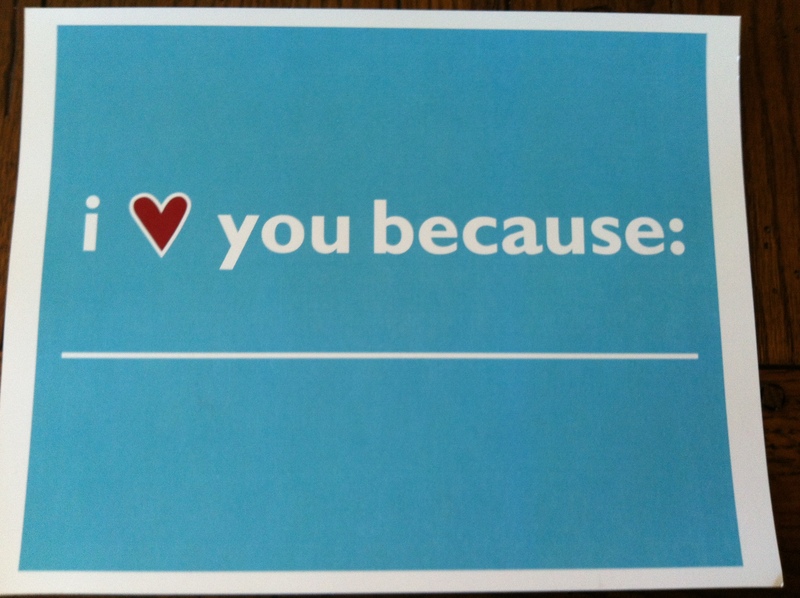 Sometimes it is a simple as “I love you because….you took the laundry to the laundry room” or “I love you because….you changed out the toilet paper roll”. The key is to show your loved ones that you love and appreciate them. It has definitely been a wonderful addition to our home! So today I am challenging you to find a new way to show your family that you love and appreciate them! It can be something big or something small. But remember, even if YOU think it is small, it could be HUGE to them. Just like the rice crispy treat! *Don’t forget about my giveaway that is going on through Sunday for a set of Goosie Cards. Click here to read about it! This entry was tagged affirmation, encouragement, Family, love, love languages, parenting. Bookmark the permalink. Love this! Those books by Dr. Chapman are wonderful! As our kids are getting older, we are learning their love languages & working to speak their language. They are great books Becky! It is also interesting that their love languages can change. I’m thankful for a small thing that can feed my daughter’s love language. LOVE it!! great idea!! We all need to know we are loved, right? Thanks Missy! You can never tell someone you love them too much! Blessings! i really really really like your ideas!! Thank you Sharonne! Such a simple idea, but it packs a big punch! What a fabulously beautiful idea! LOVE IT!